One of the downsides of enjoying the outdoors is dealing with mosquitoes. There are some easy-to-grow plants with mosquito repelling properties, which is a nice option before reaching for a chemical solution. Citronella – ‘clumping’ grass growing to a height of 5 – 6 feet. Looks great in a pot making to portable! Best grown in the garden or near the patio. Horsemint – also known as Bee balm (Monarda) – fast-growing, shade-tolerant and drought-resistant reaching a height and width of 2 – 3 feet. Repels mosquitoes much the same as citronella. Marigolds – hardy annual with a distinctive smell which some people and mosquitoes, find particularly offensive. Marigolds contain Pyrethrum, a compound used in many insect repellents. Ageratum – Floss flower secretes coumarin, widely used in commercial mosquito repellents. 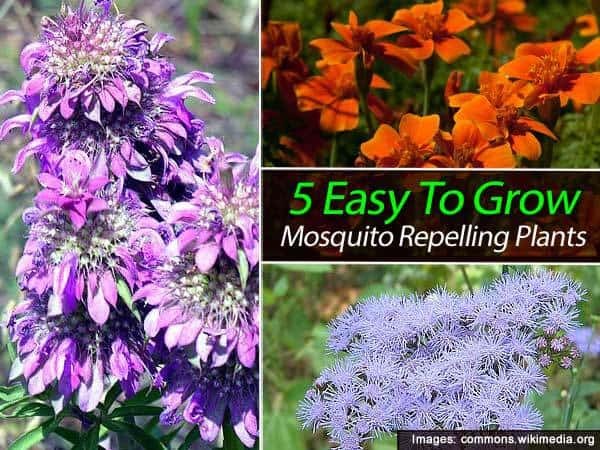 For more details, check out these 13 mosquito repelling plants and also plant some lemon grass.